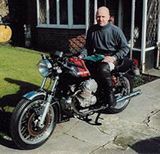 I have started this register out of interest really, to see how many Guzzi 750s from the 1970s are still around, whether still on the road, awaiting restoration or languishing in a garage somewhere. 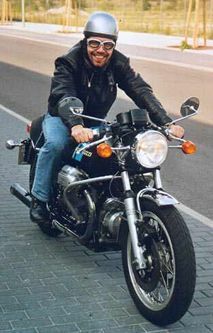 If you own, or have ever owned a Guzzi 750 ie S3, 750S or V7 Sport from that period, and want to be included in this register, please send me a JPEG of the bike that you own, or owned, the frame number, and any information you have on the bike ie how long did you own it for, what modifications did it have, what happened to it, where is it now etc etc They don't have to be original in any way, but must have been an S3/750S or V7 Sport when it left the Guzzi factory. Click here to email me. Let me know if you have any suggestions. Thanks.. INTERESTING STORIES -THESE BIKES SURE GET AROUND. Charly from Berlin's 1975 S3, in blue! Flavio Radaelli's 1975 S3, Italy, in green! Andy's V7 Sport, first ever in UK!! I NEED S3'S V7 SPORTS, 750S'S! !